Home / Pantry Items / Breads & Stuffing / B&M Bread Brown with Raisins 16 oz. Home / New England Classics / Breads & Stuffing / B&M Bread Brown with Raisins 16 oz. Home / Specialty Grocery / Breads & Stuffing / B&M Bread Brown with Raisins 16 oz. Home / Foods of New England / Breads & Stuffing / B&M Bread Brown with Raisins 16 oz. 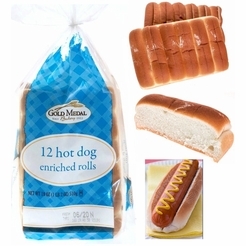 Home / BBQ & Grilling / Meats & Breads for Grilling / Breads & Stuffing / B&M Bread Brown with Raisins 16 oz. Home / Hot GIFT Ideas / BBQ & Grilling / Meats & Breads for Grilling / Breads & Stuffing / B&M Bread Brown with Raisins 16 oz. Home / Hot GIFT Ideas / Gifts For Him / Party Favorites / BBQ & Grilling / Meats & Breads for Grilling / Breads & Stuffing / B&M Bread Brown with Raisins 16 oz. Home / New England Classics / Clambake & Seafood / Meats & Breads for Grilling / Breads & Stuffing / B&M Bread Brown with Raisins 16 oz. Home / Foods of New England / Clambake & Seafood / Meats & Breads for Grilling / Breads & Stuffing / B&M Bread Brown with Raisins 16 oz. Home / BBQ & Grilling / Clambake & Seafood / Meats & Breads for Grilling / Breads & Stuffing / B&M Bread Brown with Raisins 16 oz. Home / Hot GIFT Ideas / BBQ & Grilling / Clambake & Seafood / Meats & Breads for Grilling / Breads & Stuffing / B&M Bread Brown with Raisins 16 oz. Home / Hot GIFT Ideas / Gifts For Him / Party Favorites / BBQ & Grilling / Clambake & Seafood / Meats & Breads for Grilling / Breads & Stuffing / B&M Bread Brown with Raisins 16 oz. Home / Pantry Items / Hometown Food Favorites / Meats & Breads for Grilling / Breads & Stuffing / B&M Bread Brown with Raisins 16 oz. Home / New England Classics / Hometown Food Favorites / Meats & Breads for Grilling / Breads & Stuffing / B&M Bread Brown with Raisins 16 oz. Home / Foods of New England / Hometown Food Favorites / Meats & Breads for Grilling / Breads & Stuffing / B&M Bread Brown with Raisins 16 oz. Home / Specialty Grocery / Hometown Food Favorites / Meats & Breads for Grilling / Breads & Stuffing / B&M Bread Brown with Raisins 16 oz. Home / Local Portuguese Foods / Hometown Food Favorites / Meats & Breads for Grilling / Breads & Stuffing / B&M Bread Brown with Raisins 16 oz. Home / Pantry Items / Global Favorites / Local Portuguese Foods / Hometown Food Favorites / Meats & Breads for Grilling / Breads & Stuffing / B&M Bread Brown with Raisins 16 oz. Home / Specialty Grocery / Global Favorites / Local Portuguese Foods / Hometown Food Favorites / Meats & Breads for Grilling / Breads & Stuffing / B&M Bread Brown with Raisins 16 oz. Home / Foods of New England / Local Portuguese Foods / Hometown Food Favorites / Meats & Breads for Grilling / Breads & Stuffing / B&M Bread Brown with Raisins 16 oz. Home / Pantry Items / Hometown Food Favorites / Breads & Stuffing / B&M Bread Brown with Raisins 16 oz. Home / New England Classics / Hometown Food Favorites / Breads & Stuffing / B&M Bread Brown with Raisins 16 oz. Home / Foods of New England / Hometown Food Favorites / Breads & Stuffing / B&M Bread Brown with Raisins 16 oz. Home / Specialty Grocery / Hometown Food Favorites / Breads & Stuffing / B&M Bread Brown with Raisins 16 oz. Home / Local Portuguese Foods / Hometown Food Favorites / Breads & Stuffing / B&M Bread Brown with Raisins 16 oz. Home / Pantry Items / Global Favorites / Local Portuguese Foods / Hometown Food Favorites / Breads & Stuffing / B&M Bread Brown with Raisins 16 oz. Home / Specialty Grocery / Global Favorites / Local Portuguese Foods / Hometown Food Favorites / Breads & Stuffing / B&M Bread Brown with Raisins 16 oz. Home / Foods of New England / Local Portuguese Foods / Hometown Food Favorites / Breads & Stuffing / B&M Bread Brown with Raisins 16 oz. Home / Pantry Items / Meats & Seafood / Breads & Stuffing / B&M Bread Brown with Raisins 16 oz. Home / New England Classics / Meats & Seafood / Breads & Stuffing / B&M Bread Brown with Raisins 16 oz. Home / Hot GIFT Ideas / Gifts For Him / Meats & Seafood / Breads & Stuffing / B&M Bread Brown with Raisins 16 oz. Home / Foods of New England / Meats & Seafood / Breads & Stuffing / B&M Bread Brown with Raisins 16 oz. Home / Meats & Seafood / Breads & Stuffing / B&M Bread Brown with Raisins 16 oz. Home / Specialty Grocery / Meats & Seafood / Breads & Stuffing / B&M Bread Brown with Raisins 16 oz. Home / Hot GIFT Ideas / Gifts For Him / Party Favorites / Meats & Seafood / Breads & Stuffing / B&M Bread Brown with Raisins 16 oz. Home / Pantry Items / Beans & Brown Bread / B&M Bread Brown with Raisins 16 oz. Home / Specialty Grocery / Beans & Brown Bread / B&M Bread Brown with Raisins 16 oz. Home / Pantry Items / Hometown Food Favorites / Beans & Brown Bread / B&M Bread Brown with Raisins 16 oz. Home / New England Classics / Hometown Food Favorites / Beans & Brown Bread / B&M Bread Brown with Raisins 16 oz. Home / Foods of New England / Hometown Food Favorites / Beans & Brown Bread / B&M Bread Brown with Raisins 16 oz. Home / Specialty Grocery / Hometown Food Favorites / Beans & Brown Bread / B&M Bread Brown with Raisins 16 oz. Home / Local Portuguese Foods / Hometown Food Favorites / Beans & Brown Bread / B&M Bread Brown with Raisins 16 oz. Home / Pantry Items / Global Favorites / Local Portuguese Foods / Hometown Food Favorites / Beans & Brown Bread / B&M Bread Brown with Raisins 16 oz. Home / Specialty Grocery / Global Favorites / Local Portuguese Foods / Hometown Food Favorites / Beans & Brown Bread / B&M Bread Brown with Raisins 16 oz. Home / Foods of New England / Local Portuguese Foods / Hometown Food Favorites / Beans & Brown Bread / B&M Bread Brown with Raisins 16 oz. Home / Pantry Items / Condiments, Sauces, Dressings, & More / Beans & Brown Bread / B&M Bread Brown with Raisins 16 oz. Home / New England Classics / Condiments, Sauces, Dressings, & More / Beans & Brown Bread / B&M Bread Brown with Raisins 16 oz. Home / Hot GIFT Ideas / Gifts For Him / Party Favorites / Condiments, Sauces, Dressings, & More / Beans & Brown Bread / B&M Bread Brown with Raisins 16 oz. Home / BBQ & Grilling / Condiments, Sauces, Dressings, & More / Beans & Brown Bread / B&M Bread Brown with Raisins 16 oz. Home / Hot GIFT Ideas / BBQ & Grilling / Condiments, Sauces, Dressings, & More / Beans & Brown Bread / B&M Bread Brown with Raisins 16 oz. Home / Hot GIFT Ideas / Gifts For Him / Party Favorites / BBQ & Grilling / Condiments, Sauces, Dressings, & More / Beans & Brown Bread / B&M Bread Brown with Raisins 16 oz. Home / Specialty Grocery / Condiments, Sauces, Dressings, & More / Beans & Brown Bread / B&M Bread Brown with Raisins 16 oz. Home / Foods of New England / Condiments, Sauces, Dressings, & More / Beans & Brown Bread / B&M Bread Brown with Raisins 16 oz. Home / Pantry Items / Hometown Food Favorites / B & M Baked Beans & More / B&M Bread Brown with Raisins 16 oz. Home / New England Classics / Hometown Food Favorites / B & M Baked Beans & More / B&M Bread Brown with Raisins 16 oz. Home / Foods of New England / Hometown Food Favorites / B & M Baked Beans & More / B&M Bread Brown with Raisins 16 oz. 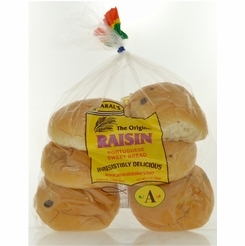 Home / Specialty Grocery / Hometown Food Favorites / B & M Baked Beans & More / B&M Bread Brown with Raisins 16 oz. 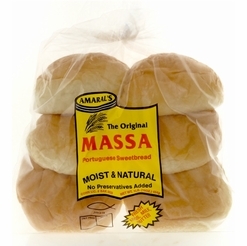 Home / Local Portuguese Foods / Hometown Food Favorites / B & M Baked Beans & More / B&M Bread Brown with Raisins 16 oz. Home / Pantry Items / Global Favorites / Local Portuguese Foods / Hometown Food Favorites / B & M Baked Beans & More / B&M Bread Brown with Raisins 16 oz. 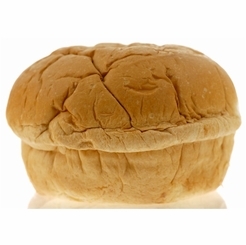 Home / Specialty Grocery / Global Favorites / Local Portuguese Foods / Hometown Food Favorites / B & M Baked Beans & More / B&M Bread Brown with Raisins 16 oz. Home / Foods of New England / Local Portuguese Foods / Hometown Food Favorites / B & M Baked Beans & More / B&M Bread Brown with Raisins 16 oz. 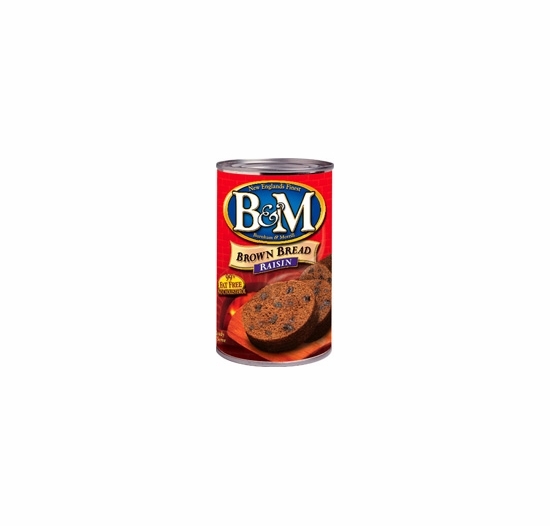 Home / Popular Brands / B & M Baked Beans & More / B&M Bread Brown with Raisins 16 oz. Slice into New England tradition when you eat B&M Brown Bread! Make the slices as thin or thick as you want! The most traditional way to have canned brown bread is alongside B&M Baked Beans! This version has plump raisins added in for a sweet taste! The molasses and raisins make a great combination of flavors. Have it right out of the can or fry slices of brown bread with butter for a crispy crunch!